This week we continue our story of the French and British 1917 offensives. Last episode we focused mainly on the planning that occurred in late 1916 and early 1917 that would setup the events for the rest of the year. These discussions between the French and British military and political leadership would lead to a plan for a simultaneous attack in early 1917. 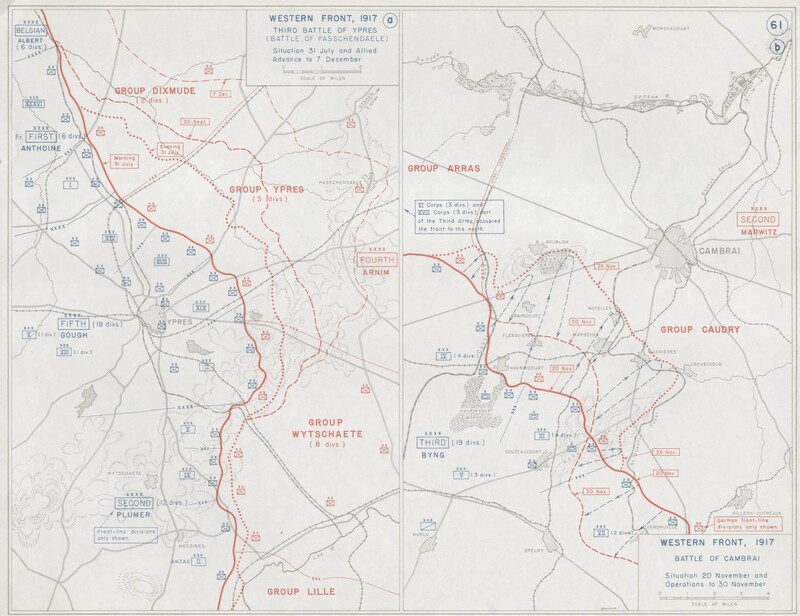 This week we will dig deeper into the situation in March and April 1917, along with the French plans for the attack. At the end of this episode we will also talk briefly about the German situation before the attack, how they were preparing for it, and precisely what they knew of the coming French efforts. 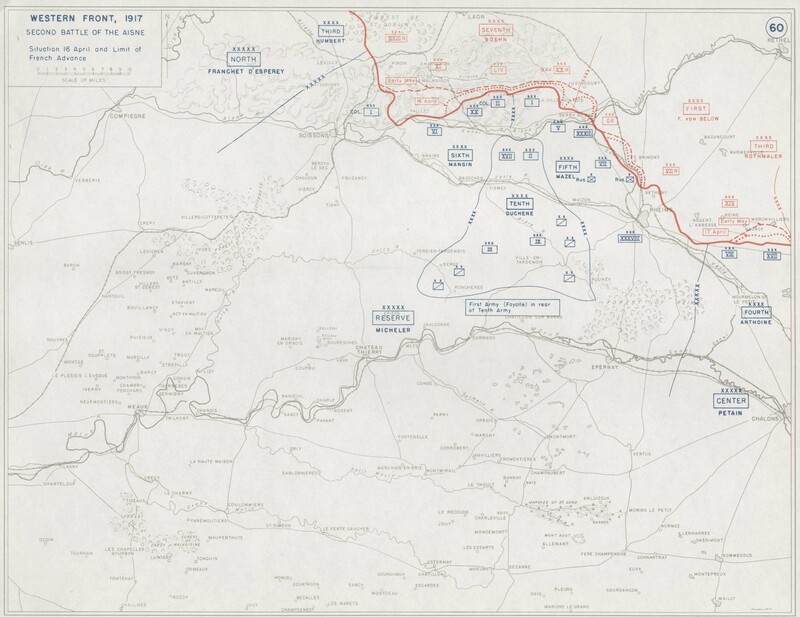 We begin today by looking at some of the details of Nivelle's planned attack. To carry the offensive forward Nivelle would use 4 Army Groups, which was for all intents and purposes the entirety of the French army. The three main army groups would be the north, center, and reserve under d'Esperety, Petain, and Micheler respectively. If the armies had been left in the line where they started the year then the main attack on the Chemin des Dames would have fallen under Petain's command. However, Nivelle was concerned about this, he did not get along with Petain very well, and so instead he created the Reserve Army under General Micheler and placed them in the line to be the primary driver of the attack. The final of the 4 Army Groups, Army Group East under de Castelnau, would provide some supporting attacks. In total there would be about 1.2 million men involved in the attack, many of these in supporting attacks along the front in the hope of preventing the Germans from rushing reinforcements to the Chemin des Dames. For this plan to be successful the French had to make the Germans believe that the main attack could fall anywhere, they would fail at this task for reasons we will discuss later. Due to their central place in our narrative let's focus on Micheler's army Group for just a bit. Under his command he had 3 armies, the 6th army under General Mangin, the 5th Army under General Mazel, and then the 10th Army under General Duchene. Mangin was positioned on the left with 17 divisions. Mangin's role in the attack was somewhat interesting due to the exact nature of the German line on this part of the front. On Mangin's left he would be attacking directly east into the German lines, pretty much what most people expect. However, east of Soissons the German line bent back and ran almost straight east-west for 10 miles, at which point it then bent back south. This put Mangin in the interesting positions of actually having most of his troops attacking to the north, which is not something that people generally consider when talking about the Western Front. Overall, Mangin was very optimistic as he always was, and he believed that his men could advance basically a kilometer an hour, with 6 kilometers captured in just 6 hours, which was a very bold estimate. To Mangin's right was Mazel's 5th Army. Mazel had 19 French divisions and 2 Russian brigades under his command, along with 128 Schneider tanks to assist. The goals of the 5th army were even more ambitious than Mangin's with the first six hours expected to yield an 8 kilometer advance. With the 6th Army attacking mainly north, and the 5th army attacking east, this would then setup the 10th army which was positioned behind them. Once the line was opened by the advance of the other two armies the 10th, and its 13 infantry divisions and a cavalry corps, would break into the German rear areas on the second day of the attack and then push it forward. If all went well the 10th would be 25 kilometers beyond the original front line by the second day and be out in the open. To accomplish all of these lofty goals all of the normal activities had to be done to prepare the area. Roads behind the front were widened significantly to facilitate the movement of men, guns, and supplies. Huge supply dumps were created for the artillery and gun emplacements were setup to house the guns while they fired. Mile after mile of telephone cable was laid to provide communications. Nivelle would also provide the attacking troops with a large number of Chauchet machine guns, roughly equivalent to the British Lewis guns, in the hopes that it would provide them with more mobile firepower. There were also several 37mm portable cannon that would be taken forward by 2 men in the hopes that it could deal with German machine gun positions. All of these preparations were completed on a massive scale, but there was still hope that the French could maintain the element of surprise. While the French would be committing over a million men to the attack, they would also be using their tanks for the first time in a large scale attack. There would be two main types of tanks that would be used by the French in 1917 the Schneider and the St. Chamond. Even though the British often get the prize and publicity for the first usage of tanks in the war, the first order for French tanks was placed just 2 weeks after the British had ordered theirs, and the French ordered more of them. The only problem for the French was that the production of these tanks would take quite a bit longer than for the British, which would result in the British fielding their first tanks in 1916 with the French waiting until 1917. The two different types of tanks were very different, with the Schneider being the smaller and far more numerous of the two. The Schneider weighed 13 tons, which was heavier than originally planned because they realized during initial trials that they had not put enough armor on the tank initially, so they had to strap more armor onto the tanks that had already been created. Much like the early British tanks the Schneider was underpowered, with just a 70 horsepower engine to pull it across the battlefield. 70 horsepower is not a lot, for reference I happen to own at Toyota Prius C which has about 73 horsepower and weighs about 13 times less than the Schneider. With the small engine the Schneider was obviously not going to set any land speed records, it had a top speed of just 6 kilometers, or 3.7 miles, per hour. Tanks are not purely about speed, and the Schneider was armed with a 75mm gun mounted on the right hand side and two Hotchkiss machine guns, one on either side. This was not a ton of firepower by world war one standards, and due to the mounting of the 75mm gun on the front right corner the tanks was, in my opinion, quite ugly. The other type of tank was the St. Chamond. This tank was even larger than the Schneider, weighing in at a whopping 23 tons. It was powered by a 90 horsepower engine which gave it a theoretical top speed of 12 kilometers per hour, a speed it had no hope of reaching on the battlefield. If you look at a picture of the St. Chamond the first thing you will notice is that the tank had a very large gun pointing straight out the front. This was a 75mm cannon, just like the field gun, and in later models it would be the exact same as the field gun with earlier models mounting a slightly modified 75. This canon was mounted in the nose of the tank, a nose that hung far out in front of the tracks, making it quite difficult to navigate the battlefields of 1917. It would be armed with 4 machine guns. One of the features of broth French tanks, and something that set them apart from the British tanks, was the placement and size of the tracks. Much like the British the French had started their tank design process by looking at farm tractors and then building up. For the British this resulted in a rejection of the small and narrow tracks of those tractors with their replacement being tracks that went around the entire body of the tank. The French did not radically redesign the tracks in this way and instead stuck with tracks that looked very similar to what were present on the farm tractors. This would severely hamper the ability of the French tanks to move around the battlefield, and I encourage everyone to go find a picture of the two tanks because I think that makes it quite obvious, and maybe a bit comical with how small the tracks are, especially on the St. Chamond. Nivelle planned to deploys as many tanks as possible for the attack. The Scheiders were available in large number, and were organized into 4 tank batteries, then into groups of 4 batteries which meant they were organized a lot like artillery. Some of these groups were formed just a month before the attack began, with tanks coming in hot off the factory floor with little time for the troops to get in training time. This push to get tanks to the front would pay off, with 128 Schneiders used for the attack. These would be joined by 4 St. Chamonds later in the offensive. Overall, the performance of the tanks would be disappointing. Much like earlier armored efforts there would be problems with tank reliability and with their mobility on the battlefield. However unlike previous armored efforts there would also be the problem of the Germans having some experience fighting the tanks, and even if this did not mean they had perfect countermeasures it robbed the French tanks of much of their shock value. As with previous attacks the French divisions on the Chemin des Dames were well supplied with artillery. The 5th and 6th Armies alone would be given over 5,300 guns, including 1650 heavy guns. This would give a concentration of a field gun every 21 meters, and a heavy gun ever 20 meters. This was far more than any previous French attack, and they would begin firing right at the beginning of April, although for the first few days it was strictly registration and counter-battery fire. The French would try to limit the amount of fire in these first few days to hide their true intentions, but by the 5th they would ratchet up the intensity all the way until the 16th. The biggest problems would be keeping the guns fed as they went through a prodiguous number of shells. Most of this difficulty came from the weather but when all was said and done, during the entire course of the attack from April1 to May 5th the French would fire 11 million rounds. A critical component of these artillery barrages was observation from the air. For this effort the French devoted hundreds of reconnaissance and spotting aircraft but they would also run into some problems. The first of these was, once again, the weather. In the 2 weeks before the attack there was only 1 day that had completely clear weather. Every other day had either fog, rain, snow, or strong winds, and often some combination of all 4. this made any kind of accurate artillery observation difficult, and it was only complicated further by the Germans. At this point in the war the Germans owned the skies over the French front, and this included the area over the coming attack. Since the artillery observation had to be done either over the line or beyond it, this made the job of the French artillery spotters very challenging, risky, and deadly. While the men at the front were experiencing issues trying to execute on the plans, there were also problems back at headquarters even if they did not know it. The best way to describe the situation at Nivelle's headquarters was that the officers and Nivelle were only considering the best possible scenarios for the upcoming attack. They believed that the attack itself was a foregone conclusion, and because of this belief they spent their time talking about what they should do after the attack was a success. This extremely positive thinking led them to begin to extend the goals for the opening attack, suddenly the planned advances got faster, and they penetrated further. At one point planning was being based on men advancing at 100 meters a minute, which was faster than the pre-war French regulations planned for road marching. It basically amounted to the men marching a 16 minute mile, which would be a pretty good pace under the best of conditions. These men were expected to hit this pace while loaded down with equipment, across the shattered battlefield, and against German opposition. All of these extensions were due to Nivelle and his staff constantly wanting to setup for their next move, just a little more here and then we can go there, just this extra kilometer and then we have this position. This time of thinking then snowballed into impossibility. The positivity would also trickle down to the troops at the front. They saw the optimism of the officers, and the massive preparations under way and it show their expectations through the roof. Not since August 1914 had French troops been reported to sing the Marsellaise on the way to the front, but here they were reported to have done so. It was as if the morale of the French army was cresting some giant hill, what they did not know was that they were on a roller coaster, and they had just reached the top, there was now only one way to go. If you remember from last episode, part of the changes that occurred around the time that Joffre was replaced was the replacement of the French Minister of War. I did not go into too much detail at that time, but the new minister was Paul Painleve. He was one of the first in the French government to voice serious concerns about the coming offensive. He tried to persuade Nivelle to make the attack smaller to reduce the risk but he realized that he could not really make Nivelle do anything. This would be a problem for the French government in the run up to the attack, even as concerns grew among many in the government they were unable to force any action on Nivelle due to his support in the press and other areas of the government. He had been able to gain this support due to his persuasive abilities but also just due to his optimism and enthusiasm, qualities that had been in high demand for years. These factors made it nearly impossible for either the politicians or the other French generals to truly change Nivelle's plans, not that they would not try. These attempts would start with perhaps the most important man in the entire army, General Micheler, commander of the Reserve Army Group, which was responsible for the attack. He had been personally placed in this command by Nivelle, but he still had some concerns. These concerns were mostly based around the idea that the situation on the front had drastically changed since the end of 1916 when the attack was first being planned. In his mind the largest of these changes was the German withdrawal to the Hindenburg line which meant that the planned attack on the salient had to be cancelled and the Germans were able to move more men into the line of attack and the Germans were able to bring more divisions into reserve, waiting to defend against an attack. These doubts would result in Micheler reaching out to Painleve directly on March 22nd. In this communication he stated that he believed that there was a very small chance of a successful attack. When Painleve discussed the matter with Micheler the General would not go so far as to say that the attack should be cancelled, just that he had concerns. These communications convinced Painleve that he needed to talk to all of the Army Group commanders to get their opinions on the situation. When he reached out to them he found that Petain was, of course, not a fan of the planned attacks, expressing grave concerns in the ability of Nivelle's methods to produce results at the front. Basically, he just had no faith that the strategies that had worked at Verdun would apply to another area of the front. d'Esperey was slightly more cagey with his comments. He tried not to criticize Nivelle too directly, but did say that he believed that the German defenses in the area of the attack were strong and well-prepared, and that they were expected an attack in the area. With the start date of the attack getting closer and closer, there were a series of meetings during the first week of April with French political and military leaders, since these were during the first week of the month they took place after artillery preparations had begun. These meetings would boil down into an attempt by the government to try and postpone or cancel the attack. Painleve pointed to the changing situation in Russia, the impending entry of America into the war, and the changes in the German front as three reasons that the attack should be changed. Nivelle, of course, resisted any attempts to change the plan. He claimed that the situation in Russia made the French attacks even more important, and that it would take the Americans too long to contribute to the war so there was no point waiting. Nivelle closed the meeting by first making sweeping gestures at the map on the wall, indicating all the gains that the attack would achieve. Then he made a promise, and this is really important, a promise to call off the attack if it did not succeed in 48 hours. Nivelle did not believe this promise would cost him anything, he planned on being through the German lines and into open country in 48 hours. While these two gestures by Nivelle closed the meeting for the day, any positive feelings that they may have created in the politicians soon evaporated. During the next few days several French leaders visited Micheler and other generals at the front to get their assessment of the situation, and none of these assessments would fall in Nivelle's favor. General Messimy, a former Minister of War, would write to President Ribot and say that he predicted a complete failure, with heavy losses to boot. He closed out his letter to the President with "I summarize here the opinions of the most highly regarded leaders of our army and most notably the leader himself who will direct the approaching offensive, General Micheler." These assessments would lead to the next round of meetings on April 6th. This meeting was attended by not just Nivelle and French political leaders, but also all of the Army Group leaders, Petain, de Castelnau, d'Esperey, and Micheler. No official minutes were taken of the meeting, in hopes that this would encourage frank and honest discussion. This limits our ability to know what was said, and what we do know comes from second hand accounts written after the war, so a grain of salt is necessary. Here is the best information we have. Once again Painleve brought up the Russian and American situations, and Nivelle once again claimed that the situation in Russia demanded action, and that the Americans would come in so late that there would be no chance of ending the war in 1917. In these ways the meeting proceeded much like the earlier one. However, it was two comments from two of Nivelle's subordinates that would be the most important pieces of the conversation. First was de Castelnau who said that if the government did not believe in Nivelle's plans, they should dismiss him. Nivelle, seeing that this was the case, offered to resign on thespot claiming that "Since I am in agreement neither with the government nor with my own subordinates, the only course open for me is to resign." Then the second of Nivelle's subordinates, and to everyone's surprise it was Petain, would say that "You cannot submit your resignation at this moment; that would have a very bad effect in the army and on the country." And that, is sort of where the meeting ended, and with it the last serious attempt to call off the attack. It ended with Nivelle refusing to change his mind but unable to resign due to morale concerns. On the other side the government had completely lost faith in the plan, but they were unable to remove Nivelle due to those same morale concerns. Winston Churchill would chime in on this situation after the war, writing only as Churchill could "So Nivelle and Painlevé found themselves in the most unhappy positions which mortals can occupy: the Commander having to dare the utmost risks with an entirely sceptical chief behind him; the Minister having to become responsible for a frightful slaughter at the bidding of a General in whose capacity he did not believe, and upon a military policy of the folly of which he was justly convinced. Such is the pomp of power." The last few weeks before the attack have greatly shaped how history looks at Nivelle. Much of the negative view of him comes from his tendency to completely ignore any and all concerns from other very smart, very capable, and very experienced men. David Murphy would say on this subject that "Some of the classic and negative traits that we associate with First World War commanders are sadly visible in Nivelle. He held tenaciously to a belief in the offensive despite ample proof of the costliness of these methods. He was also guilty of ignoring evidence that did not fit in with his operational assumptions." It is easy to see how he got to this point though, instead of embracing criticism he had actively discouraged his staff from any form of negative debate or discussions about possible unfavorable outcomes. Instead they focused on planning for the best possible outcomes, which they then honed to a fine edge. When there were concerns outside of those that he could directly control he just stonewalled them, and dug in harder to his stance that he was correct. One item that I mentioned last week, and that was considered crucial to the success of the attack was surprise. While Nivelle considered this an important aspect, he did nothing to ensure that it would actually occur. Nivelle would discuss his upcoming plans in some detail while civilians visited his headquarters, these discussions included precise details about timing and location. Then there were also constant discussions with politicians and other generals, both from Britain and France, these conversations meant that the number of people who were inside on his plans was far beyond what was reasonable to maintain secrecy. In this type of environment the information as bound to find its way into German hands. By February it was said that the basics of Nivelle's plan were being discussed at every café in Paris. It was also around that time that the Germans began to collect some hard intelligence from captured documents at the front pointing to the attack. With this information, even jus the broad strokes that were easy to come by, the Germans knew basically where the attack would land and this allowed them to bring in more troops and artillery. This would result in the number of German troops opposite the Fifth and Sixth armies going from 9 divisions to 18. These troops also brought a large increase in the amount of artillery on the German side, with there being just 90 German guns in February but over 500 by the time the attack began. These German buildups were then in turn noticed by the French, but even as this information began to trickle back to Nivelle he refused to change his plans. The French may not have had precise numbers, there were problems with German aerial superiority and the weather, but they knew that the number of infantry divisions opposite them had increased. One source of this information was German communications, with the French having broken the German codes in use at this time, even with all this information Nivelle still refused to change the plans. We will finish out this episode by discussing the German situation for just a bit. There were two important changes for the Germans before the attack was launched, the first was the retreat early in the year, and the second was the changes in German defensive doctrine. When it came to the retreat, while it was voluntary, it was also a necessity for the Germans. During the autumn of 1916 work had already begun on the Hindenburg Line, which stretched over 140 kilometers and was built by a workforce of 65,000 men. The entire goal from the beginning was to create a new position that could allow the Germans to retreat, shorten the front, and move some divisions into reserve. All of these goals were accomplished and after the retreat, codenamed Operation Albrecht the Germans were able to move 10 divisions out of the line, it would be partially these divisions that would be sent south to meet the French attack. The second change was some changes in German defensive doctrine. At the end of 1916 Ludendorff had put in place a new defensive strategy, a more elastic defense than what the Germans had been doing up to that point. In the first three years of the war the Germans still had a pretty rigid form of defense, there were trenches and troops were put in them and expected to hold them at all costs. There had been some changes in terms of what percentage of these troops were in the very front line of trenches, but the theory had remained the same. The new defensive tactics were quite different. At a basic level the Germans would leave the front line almost entirely empty, with only a few observation posts to report on enemy activity. Then behind that line there would be a zone occupied by strongpoints manned by machine gunners and a few other troops. These positions would not be a continuous line but would instead be dispersed either in dugouts or just strung out into shell holes. The movement out of lines and into shell holes had been a tactic used in the later stages of the Somme defense and had proven successful at reducing the effectiveness of British artillery since it spread the German troops out over a large area. The final piece of the new defenses was the final area which is where the Germans would actually start resisting. These final lines would as frequently as possible be on the reverse slopes of hills to protect it from artillery. A critical piece of this defense was the counter attack troops stationed near the front with orders to react to the attack as soon as possible. Officers in these units were given as much autonomy as possible when it came to how and when to launch their attacks, with the German leaders realizing that they often would not have time to communicate back to their commanding officers. The entire setup was designed to absorb the first push from the French and British, which with their artillery advantage they had become quite good at accomplishing, while sustaining the minimal number of casualties then right as the Entente troops were running out of steam BAM they would be hit by a determined German counter attack. If you want far more information about these changes, there is an entire Patreon episode about these changes. While the Germans had given their troops a new defensive plan for 1917 they also had defenses that they had been building up for almost 3 years. They had first occupied this area of the front after the retreat from the Marne way back in September 1914 and since that time it had a pretty quiet sector, and the Germans had been busy improving its defenses. They controlled the ridgeline and had planted the normal types of defense like barbed wire, machine gun nests, trenches, deep dugouts, all the items that the German defenses had become known for. They were also able to take advantage of abandoned underground stone queries that dotted the ridge. These created perfect shelters for German troops before the attack, they were completely artillery proof and large enough to allow counter attack troops and supplies to remain safe. The Germans had built their entire defensive system around these mines and shelters, with their exits perfectly placed to provide maximum assistance to the defenses. Outside the Hindenburg Line these were probably some of the most formidable German defenses on the entire front. While the Germans would eventually had a decent idea of what the French were, that is now where they started the year. 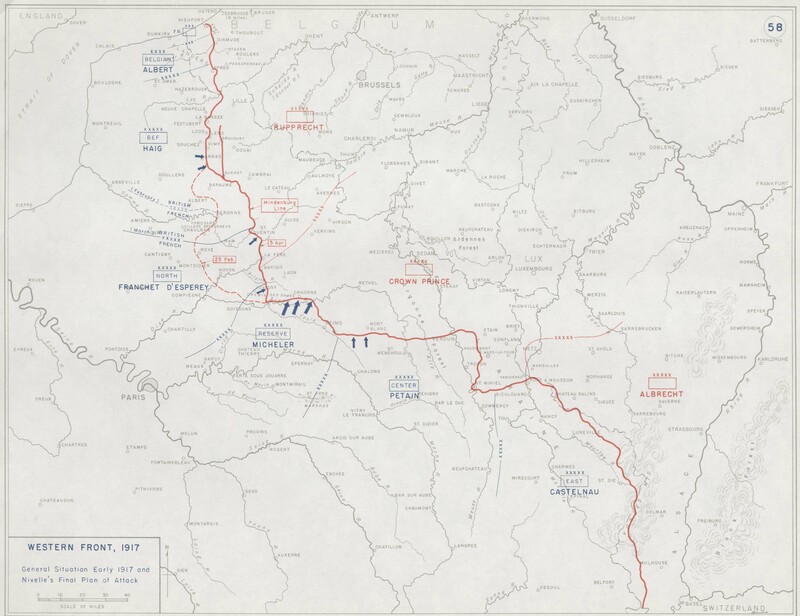 At the beginning of 1917 they had a general idea about possible areas of the front where the French could attack, for example it was unlikely that the French would attack in the far south in the Vosges, but they did not know precisely where the attack would fall. They were of course doing activities like gathering up information, determining the positioning of reserves, and looking at French railway usage. These activities would lead them to believe that the attack would occur along the Aisne river in Champagne as early as February, this just based on where the French were building up forces and supplies. In March the serious dominos began to fall into place. This began with a raid on March 3 during which the Germans captured a very important document, here is Crown Prince Wilhelm who would describe document "The French regulation document known as ‘Instructions concerning the aim and conditions of a general offensive’. 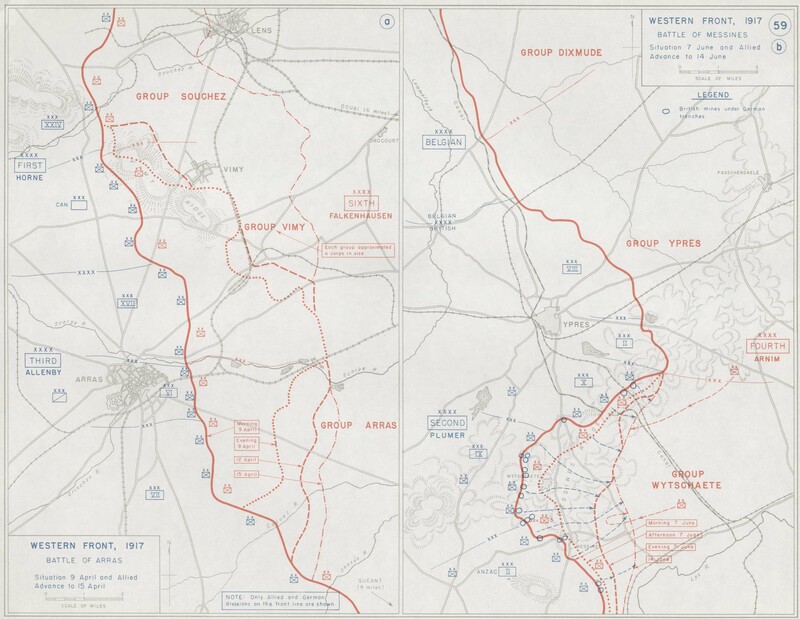 This had been implemented by General Nivelle on 16 December 1916. It contained highly valuable information. It made clear that this time it would not be an attack on a specific target but a sweeping breakthrough offensive." At the end of the month, on March 31, they captured a French officer who was carrying fully marked maps, signals instructions, and radio codes. These pieces of information allowed them to rush last minute reinforcements into the area. Then in April they found more information which they captured on April 5th. This contained the precise orders for 2 divisions and 3 corps, incredibly valuable information. By this point the Germans knew about as much as the French about what was about to happen, and the French knew that they knew. Now the stage was set, and the attack was about to happen, both sides knew it and they were prepared. I hope you will join me next episode during which we will cover the attacks, in what is setup to be a very long episode.